We headed out of the campground and quickly crossed into Minnesota. We are heading up to Austin to go to the bike shop to ask how to get to St. Paul and also to visit the SPAM museum. Our ride to Austin was a pretty quick and easy ride of 20 miles. We stop at the bike shop and discover that no one does any touring…though to my eye there are plenty of road bikes. So we really got nowhere in terms of directions. One of the cool bike shop guys comes out and looks at our bikes and quickly cleans the chain and lubes them back up with the help of Nathan holding up the back of the bike. 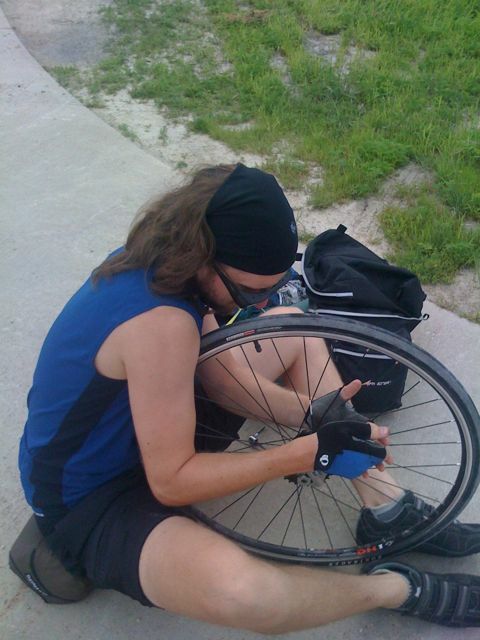 Bike guys are cool and can always do stuff much faster than us, well, I can’t actually do anything, but Nathan can. We head to the SPAM museum and stop at a cafe across the street. We are quickly offered the regular menu or the SPAM menu. We chose the regular. The SPAM museum didn’t open until 10 am. But by the time we headed over at about 10:20 the parking lot was filling up. For the SPAM museum! Seriously. It actually was a pretty cool museum. It is really well-done and the people are very proud of it. Hormel sunk a bunch of money into the museum, which opened in the last few years. Tom Brokaw was at the opening of the museum and the dedication to the WWII veterans. Did you know that… they are actually hiring more workers in their SPAM factories. More SPAM is being consumed now than ever. It is very versatile. Hawaiians have the highest per capita consumption of SPAM in the entire world and every year thousands of Hawaiians make the trip to Austin, MN to go to the SPAM museum. SPAM is sold on every continent except Antarctica, where it is just distributed by those who work there. Nathan still has yet to try SPAM (he thinks). I personally have had enough to know that it certainly can be used in many ways. We left the SPAM museum to go to the library. We knew we wouldn’t make it to the Twin Cities that day because it was about 100 miles. But my friend from middle school youth group, Naomi Reeves, offered us a place to stay and said that she could come pick us up. So we looked for a place about half way in between St. Paul and Austin, which was Kenyon. We came up to the library only to find that it was closed for the 4th of July holiday. So we sat outside and used the outlet to recharge the iPhone. It was pretty interesting telling all of the people that came up that the library was closed and that we would put their books in the book return right above Nathan’s head. He eventually moved so that they could do this themselves. It is not easy to get from Austin to St. Paul. We found some nice back country roads that actually took us more east instead of north, but they were still pretty nice to ride on. We finally dead ended into 56 and it was not a nice road to bike on. It had a plenty wide shoulder, but was bumpy and in bad shape and busier in parts than we would have wanted. We were on this road forever. After about 20 more miles, Nathan hears another pop. Yup, another spoke. But this time we have the tools, all of the tools, with us, in the spot in which we are in. So of course, it is going to work, right? No. 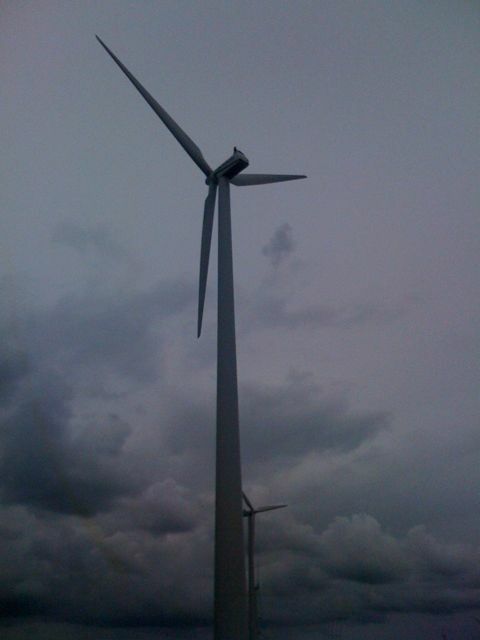 We unload near a huge windmill and Nathan tries to undo the freewheel, but he can’t get it undone. He doesn’t have enough torque to even begin to move it. At this point we’re about 5 miles out from Dodge Center and at least 20 miles from Kenyan. I start trying to flag down a truck, but to no avail. In the movies they make this look really easy. It is not. I thought that I had a good technique: stick out thumb, look pitiful, and smile a very little. I’m pretty sure that people thought that I thought it was a nice day and I was giving them a thumbs up at the good job they were doing driving. I can't do it, captain! I don't have the power! I call Naomi and tell her that we need her to come further down the road to Dodge Center and to meet us at the Dairy Queen. Nathan cannot get the freewheel off and so we load every thing back up and head the 5 miles into town hoping that Nate won’t bust too many more spokes. We finally find the Dairy Queen and order more delicious junk food and wait for Naomi. She makes great time and is there within 20 minutes. I can’t tell you how excited I was to see her. Naomi was always an open, fun, caring, and non-judgmental person to be around. She still is. We get on the road and put my bike in her 1 bike rack on top of the car and take Nathan’s wheel off and stuff it in the trunk with the rest of our stuff. We have a great trip getting filled in on life over the past 8 years since I’ve seen her. A lot has happened in both of our lives. We head into downtown St. Paul and pass the History Center (I spend a lot of time here in late elementary school and junior high), a whole bunch of big buildings, and the Cathedral. Naomi, Joel (her boyfriend), and Dan (her younger brother) live in an apartment in the thick of a hip, fun, young, working professionals district with lots of great restaurants and pubs. Naomi had threatened that she was going to feed us so well we wouldn’t know what to do with ourselves. This was very true. 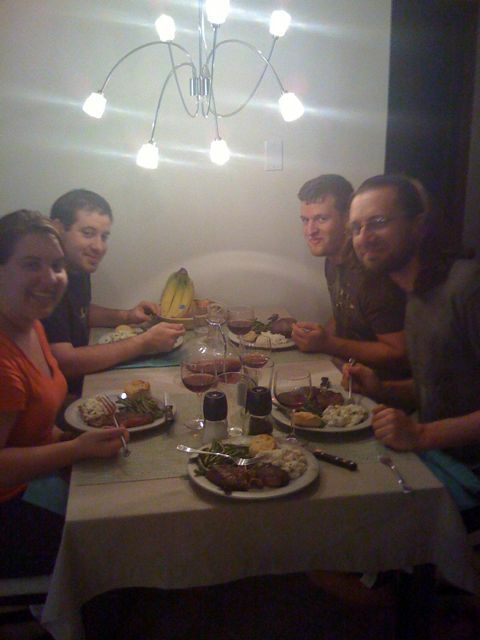 Dan and Joel came down and helped us bring up our stuff and they had already started on dinner. Sadly, I had a bit too much Dairy Queen and should have held off a bit more. We had an awesome gourmet dinner: mozzarella, tomato, and basil salad, amazing green beans, and Dan grilled perfectly medium rare steaks. I wanted the title to read: I’m in heaven, but we feared that people might take this the wrong way. 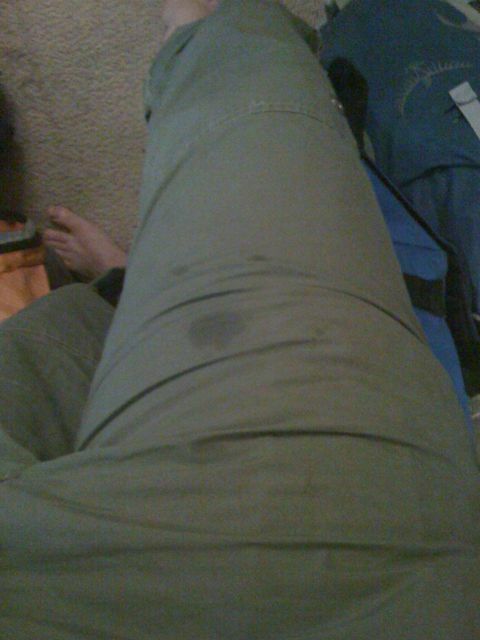 We finished up dinner, I spilled on myself. Then we headed to an ice cream shop a few blocks away. Ice cream is really a wonderful food. We headed back down Summit Ave and looked at all of the historic houses and fireworks are going in the background. It was an amazing night. We were all tired and watched a bit of TV and headed to bed. 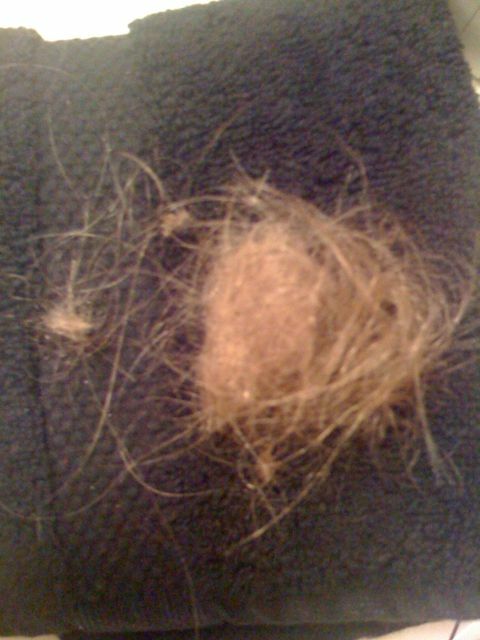 I finally brushed my hair, as you can see below, and saved this for Jenna. Nice glob of hair Ames…Where’s the pic of you with brushed hair? Dudes! One of my best friends lives in Albert Lea, MN, just a bit N of the IA border, and just a bit W of where you entered MN. I should have thought of that a long time ago! Oh well….glad things are so considerably awesome!